For many years, the return migration issue has occupied center stage in academic and policy debates regarding how to mobilize émigré resources to promote economic development in migrant-sending countries. While many policy options have been discussed, and occasionally implemented, a consensus has emerged that these policies are often ineffective or fall short of achieving anticipated objectives (for a policy overview see Rannveig Agunias 2006; also Kubat 1983). The reasons are obvious, as under the conditions return migration policies are generally enacted, they are inadequate to satisfy economic and work longings leading to emigration in the first place. Over the long run, they are also less than optimal as inappropriate policy frameworks in the countries left by the migrants are often incapable of sustaining the rapid economic growth that potentially could reduce major disparities between sending and receiving countries. As a consequence, in the contemporary world, the potential for permanent return migration is severely constrained, with the number of return migrants generally being limited. Furthermore, evidence from some studies also suggests that the responsiveness of emigrants to incentive packages embodied in many returnee programs is generally low, the vast majority of migrants availing themselves of these incentives returning whether or not they were available. This was not the case in the past as return migration from the United States, Cuba and other countries during the first half of the 20th Century were quite significant. Some estimates suggest that as many as 30% of Southern and Eastern European migrants to the United States returned home, whereas with regard to Cuba, the percent of return migrants —whether to Spain or neighboring English-speaking Caribbean countries—may have been even greater. Depressed economic conditions and anti-immigrant policies (e.g., the 50/50 Cuban law) were responsible for the return of so many migrants. One important characteristic of these return flows was that they mostly involved unskilled migrants. Given the right conditions, in our current world of globalization, permanent return migration could be beneficial to countries of origin, especially if return migrants could contribute investment capital or skills in short supply. The permanent return option, furthermore, could prove to be a viable alternative in countries such as Cuba where, for at least some migrants, the main motivation to depart was political in nature. Such was the experience in the Southern Cone with Argentina, Chile and Uruguay, countries that recorded significant return migration following the demise of military dictatorships in power during the 1970s and 1980s (Mármora 1997). Nicaragua similarly experienced a return flow following the electoral defeat of the Sandinista regime in 1990, just to cite some recent examples from the Western Hemisphere. The permanent return alternative for Cuba, however, seems to hold only limited promise given the inevitable demographic decline of the early cohorts of politically motivated migrants of the early 1960s, and even for the Mariel arrivals, as these migrant cohorts continue to age and die. The more recent migration flows—although to an extent still motivated by the country’s political situation—departed Cuba mainly for economic reasons and are less likely to respond to a regime transition, unless recovery prospects for Cuba significantly improve. Some will no doubt return but with fewer human capital and financial resources than possessed by earlier refugees. Some potential exists however to encourage some of the foreign-born descendants of the migrants to become invested in the country’s future, as recommended by the International Organization for Migration (2005:97), particularly since the parent generations have managed to instill a strong sense of national attachment in their children. This is not to say that under the proper circumstances a future post-revolutionary Cuba will not see the return of select former emigrants, whether on a permanent or temporary basis. There are reasons to assume that with the proper policy framework, many elderly Cubans may elect to return to take advantage of the country’s anticipated lower cost of living, particularly if they are given assurances that their needs in terms of social amenities and medical services are provided. Many U.S. retirees have discovered the advantages of countries like Costa Rica, Mexico, and Panama, flocking in increasing numbers to these retirement havens, at least for part of the year. Many Cuban-Americans of retirement age may find this option attractive. Grounds for optimism are much firmer with respect to the resettlement in Cuba of migrants who may do so without severing their links with the United States or other destination countries, maximize these links for their personal, as well as Cuba’s, benefit. The benefits of emigration for sending countries have generally been perceived as arising from labor market effects and the income streams associated with remittance inflows. The general assumption underlining the former is that migrants move from countries with labor markets characterized by an overabundance of workers, and thus with high unemployment and underemployment rates, or offering low wages in comparison to destination countries. Labor market pressures could result from structural factors, such as inefficient resource allocation (e.g., land distribution patterns), relentless pressure exerted by high population growth rates, or economic bottlenecks associated with inadequate regulatory environments, among many other factors. A conventional conclusion is that by removing excess workers, labor market competition is eased, some benefits accruing to non-migrants workers, just as average incomes for households with migrant workers increase with the arrival of monetary remittances. With regard to remittances, the picture, while generally positive, can be qualified in several respects. A recent assessment of the impact of remittances in Latin American countries conducted by the World Bank (Fajnzyber and López 2007:57–59) concluded that they generally have a beneficial impact on growth and poverty alleviation, but that, on the whole, these impacts are rather modest. Furthermore, the effects of remittances in the development of financial markets is less pronounced in Latin America than in other major world regions, while they tend to depress labor supply (in terms of hours worked and labor force participation rates). Remittances, furthermore, are prone to produce real exchange rate appreciation, thus making recipient economies less internationally competitive. The World Bank study concludes that although remittances can act as a development engine, they “are neither ‘manna from heaven’ nor a substitute for sound development policies … the way countries benefit from remittances appears to be positively related to the countries’ own institutional and macroeconomic environments, so that countries that rank low on these fronts should expect even more modest impacts” (Fajnzylber and López 2007:59). This conclusion, as noted below, is worth highlighting as it applies with equal vigor to a range of policy initiatives formulated with the intent of enhancing the beneficial impact of international migration in migrant sending countries. Several qualifications should be applied to the notions summarized above. The nature of the emigration flow, the socioeconomic characteristics of the migrants, their financial capacity to assist the homeland, how remittances are used by recipient households, and the maturity of the migration flow, among many other factors, serve as important analytical devices to more finely disentangle the benefits—and just as often—the adverse consequences of migration. Mature and routine labor streams established over many years (e.g., from Mexico to the United States) can generally be expected to have different consequences than explosive emigration flows that arise from natural or man-made catastrophes, as occurred in Central America during the 1980s. The labor characteristics of migratory flows profoundly influence the shape of the benefits that may accrue. The consequences of unskilled emigration, for example, are qualitatively very different from a migratory situation with a preponderance of skilled professionals. While the individual remittance contributions of unskilled migrants may be less due to lower wages, in the aggregate they may exceed those of more skilled migrants (assuming the differential flows are of approximately equal numbers), as the latter are more predisposed to become assimilated and reunite with their families in host societies. Similar differentials arise from how migrants become inserted in receiving countries labor markets. Undocumented migration over the short-term may inhibit the volume of remittances, while over the long-term may sustain them by interfering with the migrants’ ability to plant firm roots in destination countries. The brain drain, or the permanent emigration of skilled workers, has garnered much attention and generated considerable debate (see, for a recent review of conflicting viewpoints, Ozden and Schiff 2006). A traditional line of thought has postulated that the process is very costly for sending countries—particularly when they are in the developing world—as they deprive these nations from badly-needed and generally scarce professionals with much to contribute to socioeconomic development and the provision of essential social services. Most noted has been the emigration of health care workers, including physicians and nurses, from many countries, particularly from Africa and the Philippines. These flows have also been significant from Latin America, notably so from the English-speaking Caribbean. The alleged adverse impact of the emigration of natural scientists, economists, and technology workers has also been repeatedly documented. The Cuban experience validates the conventional negative assessment. During the 1960s, the massive emigration of much of Cuba’s managerial, professional, and technical elite had disastrous consequences for the national economy. The physician stock alone is said to have been reduced by 50%, with equally significant losses being recorded across the professional kaleidoscope. The economic consequences were immediately felt as the absence of skilled professionals seriously compounded the consequences of ineffective strategies embodied in the socialist development model. The Castro regime was forced to implement crash training programs at home, while extensively relying on overseas training opportunities afforded by the socialist camp, led by the Soviet Union, at the height of the Cold War. It took Cuba decades to replenish its professional ranks although the case can be made that the costs were lasting as the country lost the historical memory embedded in a professional class attuned to the workings of a market economy. Juxtaposed to the views expressed above are several novel and/or revisionists perspectives that challenge and turn on their head the most pessimistic assessments, at least under some particular circumstances (Ozden and Schiff 2006). While few could quarrel with the view that massive emigration of medical personnel from countries with high population-to-physician ratios is detrimental to sending countries (as is currently the situation in much of Sub-Saharan Africa), the analysis is far more nuanced when other types of professional emigration—including that of students pursuing advanced training abroad—are assessed, or when individual or global welfare considerations are taken into account. Many analysts have noted that the individual productivity of professionals is not solely tied to their skill level; it is significantly mediated by factors such as the technological and economic environment in which they are employed. In many countries, therefore, highly-skilled workers are often grossly underemployed due to local labor market constraints. These intervening variables explain, for example, the very common observation that the productivity of developing country skilled workers increases dramatically when they migrate from poorly endowed to economically and technologically advanced countries. Take the extreme but useful illustrative example of a developing country biomedical research scientist offered an immigrant visa to work in one of the top research laboratories in Europe or the United States. By having access to superior facilities and a broader network of like-minded investigators, the migrant scientist is capable of making contributions undreamed off in his country of origin. As a result, not only does the welfare of the migrating scientist and his or her family increases (through higher wages and improved living conditions), but so does the general welfare of the broader community through the scientist’s contributions. This applies to the receiving country, but potentially also to the sending country, if the contribution has universal applicability to human welfare. A benefit would also accrue to the sending country by the remittances made possible by the higher income earned by this scientist abroad. The productivity enhancing effects of the socioeconomic and political setting is made even more evident by the entrepreneurial proclivity of many ethnic migrant communities in destination countries. The United States offers ample evidence of successful entrepreneurial ventures among migrants not particularly noted for their economic success at home (although individual entrepreneurial predispositions ought not to be discounted), but that managed to take advantage of market opportunities and new skills learned in the adoptive homeland. Particularly revealing has been the extraordinary success achieved by highly skilled immigrant communities from South (e.g., India) and East (e.g., Taiwan, Korea) Asia in contributing to the growth of cutting edge economic sectors such as information technology and bioengineering. Not only do natives from these countries account for a significant number of the high tech workers in enclaves such as Silicon Valley, or the technology corridors surrounding Boston, Washington and so many other American cities, but in a span of a few decades they have made a disproportionate contribution to the entrepreneurial ambiance of these enclaves through the establishment of innovative firms. Such has been their success that the knowledge acquired, market experiences gained, business contacts made, and financial capital accrued have been instrumental in allowing many former migrants—upon their permanent or temporary return—to replicate at home their overseas achievements: Bangalore, Beijing, Shanghai, and Taipei are among the examples most often cited of the consolidation of a generalized technical culture partly encouraged by the establishment of migrant networks (Wickaramasekara 2002:13). This development is embedded in the transnational concept whereby social and productive distances between and among countries have been compressed through the emergence of global markets, shaped in turn by modern means of transportation and communications. Transnationalism has been facilitated to a considerable extent by the expansion of and long term declining cost trend for modern means of transportation that facilitate frequent travel, just as the development of current communications (Internet, cellular phones, lower cost of international telephone calls) contribute to more dynamic interactions between homeland and destination countries (O’Neil 2003:2). As a result of the confluence of these factors, in the last few decades a relatively new pattern of migration has emerged that, together with other factors, is dramatically altering the economic prospects for many countries. This is the phenomenon of circular migration. The beneficial impact of the return of many former migrants to their countries of origin and the observation that many do so in a recurring, non-permanent basis, has given rise to the notion of circular migration (O’Neil 2003). In circular migration the migrant does not sever links with either the homeland or the host nation completely but rather, by keeping a presence in both sending and receiving countries, manages to maximize the skills, financial resources, contacts, business or professional skills, etc., acquired abroad to improve both his personal and/or family situation, assisting along the way with the socioeconomic and, it is often posited, the country of origin political development. Circular migration entails long term binding social and economic ties with countries of origin and destination as emigrants often elect to apply the knowledge, skills and resources acquired abroad in the pursuit of economic activities in their countries of birth, while retaining close links with both countries. As noted above, circular migration has been credited for much of the achievements of China, India, and Taiwan in developing vibrant high tech industrial sectors, not only through skill transfers, but also through their entrepreneurial proclivities and business connection abroad (see, for a review of national experiences, Rannveig Agunias 2006). Such flows have also been intertwined with the growth in manufacturing in the Asian tigers as well as China. The circular migration of expatriate Chinese entrepreneurs stands behind the emergence of China as a global manufacturing powerhouse. By combining their entrepreneurial skills, knowledge of foreign markets and traditional production processes with China’s (and Southeastern Asian countries) nearly unlimited pool of low-cost labor, return migrants have helped thrust China and other countries into the global economy in barely a generation. Of course, these countries’ business and labor market environments were instrumental in allowing the migrant entrepreneurial and technological seeds to germinate. In both instances, internationally-competitive skilled labor market wage rates and/or the availability of a sizable professionally trained local labor pool served as critical inputs for the establishment and growth of mature and high tech industries. The availability of the latter was facilitated by educational systems that at least in elite institutions (e.g., the Indian Institute of Technology, IIT) were capable of training professionals to world class standards. Not least significant were business climates that encouraged the introduction of innovative practices by the migrants and that simultaneously welcomed the presence of foreign investment. This type of migration also partly accounts for the emergence of migrant-related business activities in many Caribbean Basin countries, in many cases initially developed to satisfy the demand for ethnic goods in U.S.-based immigrant enclaves. This phenomenon has long been noted among Englishspeaking Caribbean migrant communities (Pastor 1985), becoming since the 1990s quite visible among Central and South American migrant colonies, just to note a few. Small retail stores cater to an ethnic clientele wishing to consume imported goods from home countries. Another manifestation is the trucking companies that transport goods overland from and to the United States and Central America. The presence of ethnic enclaves and the facilitating role of ethnic entrepreneurs anchored in source and destination countries also appear to account for a growing number of call and data processing centers in various countries of the region, such as the Dominican Republic, Costa Rica, and Panama, a trend likely to intensify with the numerical increase and growing affluence of Latin American-origin immigrant communities in the United States. Just as English- language service calls made to large international corporation 800 numbers are automatically switched to technical support centers in India, calls by Spanish- speaking U.S. customers are beginning to be routed to call centers in Caribbean Basin countries. Circular migration is often credited with much of the spectacular increase in foreign investment in the Chinese economy as entrepreneurs from expatriate Chinese enclaves pour between $40 and $50 billion annually in the country. As in the case of India, Chinese circular migrants have been a major factor behind the country’s technological leapfrogging as many have brought, together with their investments, new skills acquired abroad, while maintaining strong business ties with foreign firms (Rannveig Agunias 2006:7–8). Migrants moving back and forth also account for the establishment and expansion of many enterprises not necessarily linked to international trade (Rannveig Agunias 2006:10). These migrant entrepreneurs, however, play a prominent role in the modernization of production and service procedures. They act as change agents by introducing new technologies and managerial practices, thus contributing to the modernization and development of home countries. They also play an important role as intermediaries and facilitators for investments by large multinational corporations that find advantageous to work with representatives familiar with the local environment to more effectively navigate through host country regulatory procedures and customs. Finally, the circulation process is also in evidence in the growing number of charitable organizations set up by migrants to assist home communities, such as the hometown associations often found among Mexican and Central American migrants. The foundation for comparable mechanisms to emerge in a posttransition Cuba may be found in the municipal associations established in South Florida. They already have a history of mobilization to assist members of the mother communities as exemplified by the assistance many of them provide to new arrivals and their willingness to gather emergency donations for shipment to Cuba following natural disasters. The return migration process, whether permanent or circulatory, can have perverse as well as positive economic consequences. In some respects, these consequences parallel those associated with remittances flows regarding upward pressures on prices that adversely affect the purchasing power of non-migrant populations. A considerable infusion of foreign currency by return migrants with average incomes much higher than the local average will result in increases in real estate values and in consumer good prices. While the magnitude of these effects is mediated by the extent of return migration and average income levels, they could be sufficient to erase the income effects associated with the return migration inflow. Negative perceptions regarding the return migration are also possible as the non-migrant population may feel it is been crowed out and not gaining much from the migrants’ return. Labor market effects, while in the main expected to be positive as the inflow of migrants should lead to increased demand for locally-produced goods, may also have some harmful consequences for local workers. This would depend on the extent to which returnees complement or displace local workers. Displacement may occur if the returnees are more efficient than local workers, or if they introduce in the local labor market more advanced production processes likely to make workers redundant. More probable, however. is that return migrants contribute to a surge in demand for labor through the combined effects of their aggregate demand and dynamism injected in an economy, such as Cuba’s, long burdened by a detrimental policy environment, a dearth of investment, and an incentive structure not conducive to high productivity. Despite the historically poor performance of policies designed to attract the return of migrants, recent years have witnessed some successful interventions. These policies have worked with more effectiveness when they have embraced incentive packages designed to encourage highly-skilled professionals to return. The establishment of research parks (as in Korea and Taiwan) and mechanisms to link potential returnees with financial assistance to establish their own firms, subsidized salaries, housing allowances, the establishment and maintenance of networks and databases to match skills with demand by employers, and duty free purchase of automobiles and computers, appear to have had some success in China and several Southern Cone countries (Rannveig Agunias 2006:21–24). Other policy levers include the increasingly wider adoption of dual nationality to encourage migrants to remain attached to the homeland, while also facilitating the return option, whether permanently or temporarily. Ten countries in Latin America with large U.S. diasporas, for example, have embraced this concept (Rannveig Agunias 2006:26). What is generally understood is that certain preconditions increase the likelihood of success for such programs. Among the most obvious are a peaceful and stable political climate and, as noted earlier, a propitious economic environment. An important consideration in such a setting is if costly policy interventions are necessary as potential returnees would most likely respond to market signals absent what most likely could prove to be unnecessary incentive packages. • involved in considerably fewer economic activities vis-à-vis their country of origin than their counterparts from other countries (Orozco et al., 2005: 16, 19, 21, and 36). One overall conclusion of the study was that Cuban migrants as a whole are generally less engaged with the home country than emigrants to the United States from other national origins. This should be expected given the nature of the migration flow, the socioeconomic and political nature of the Havana regime, and not inconsequentially, the U.S. economic embargo against Cuba. A transitional shift to a more open form of government and market-oriented economy—plus the lifting of the U.S. embargo —could enhance manifold the policy appeal of measures to maximize the beneficial effects of transnational links by facilitating financial and other interactions between Cuban emigrants and the source country. This is so for several reasons. The fact that South Florida, the hub of the Cuban- American community, lies only a few minutes flying time away from Havana, and that trade and tourist ties can readily be reconstituted through Miami and surrounding commercial gateways, means that the country will not have to overcome the enormous distance and cost disadvantages migrants must negotiate traveling back and forth to countries located as far as China, India, and Taiwan. Transportation costs would be highly competitive as, for example, by resuming ferry service from Cuban ports to Miami and other U.S. cities in the South Eastern seaboard. The Asian countries managed to overcome transportation cost disadvantages thanks to the competitive edge they gained from the synergies made possible by the technical, business, and financial capital provided by their expatriate communities, and the availability of a well-educated domestic labor force. It seems that the complementary relationship partly responsible for the remarkably South Asian economic success in selected sectors could potentially be replicated in Cuba as long as the post-transitional national authorities implement a policy environment friendly for foreign investment and circular migration. The second precondition favoring such a potential outcome is the allegedly high educational standards attained by Cuba’s population, a policy priority of the regime in power for nearly five decades. While some questions are in order about the actual skill levels of the country’s labor force—including how effectively it can compete in the global marketplace—it seems reasonable to assume that, on the main, Cuban workers have skill levels markedly above those found in most Latin American countries. Under the auspices of the former Soviet world, the national educational authorities gave emphasis to the acquisition of technical skills (e.g., biotechnology, engineering and the sciences in general), disciplines at the core of the major productive transformation still unfolding on a world-wide basis today. A minimum number of key policy measures should include, aside from a reasonable macroeconomic environment, the expected guarantees for foreign direct investment and intellectual property protection, some specifically crafted to appeal to the transnational community (Travieso-Díaz 1998). These may include the granting of dual citizenship and flexible residential rights; offering select material and nonmaterial incentives (e.g., duty free entry of personal effects and productive equipment, short-term opportunities for migrants to assess the viability of engaging on a more permanent basis with the home country); complementary investment capital; and the setting of specialized service centers to ease entry into the local labor market (Rannveig Agunias 2006:21–27). Complementary domestic institutions could be built to ensure that a generally capable national work force acquires the latest technological training and required market-driven competitive skills. Johnson and Sedaca (2004:iii) also enumerate reliance on networking mechanisms such as online portals and databases; publicizing among the expatriate community the availability of such information; sharing tools through public awareness campaigns; and providing support for effective knowledge transfer techniques. They also call attention to the potential for diaspora-based consultant networks that, on a paid or voluntary basis, could support the homeland’s growth on a cost effective basis. In addition to the above, and as noted by Orozco and his collaborators (2005), migrant sending countries can reap many benefits from other policies designed to maximize the utility of transnational ties. Of most relevance to the Cuban situation appear to be initiatives designed to augment the productive potential of remittances, the value of émigrés as tourists and consumers of domestically produced goods, and, last but not least, the ability of the migrants to channel some of their resources as development tools through philanthropic donations and other related activities. Potential benefits that could accrue to Cuba from the encouragement and more productive use of remittance could be significant. Note has already been made of the potential for a post-Castro Cuba to become a retirement haven for Cuban-American and elderly Americans (Travieso-Díaz and Musa 2003), and how the provision of health care services and the expansion of Medicare coverage to Cuba could greatly encourage such flows (Díaz-Briquets 2001), and thus they are just mentioned here. Attention is called instead to a growing transnational phenomenon impacting several Latin American countries with significant emigrant populations in the United States. 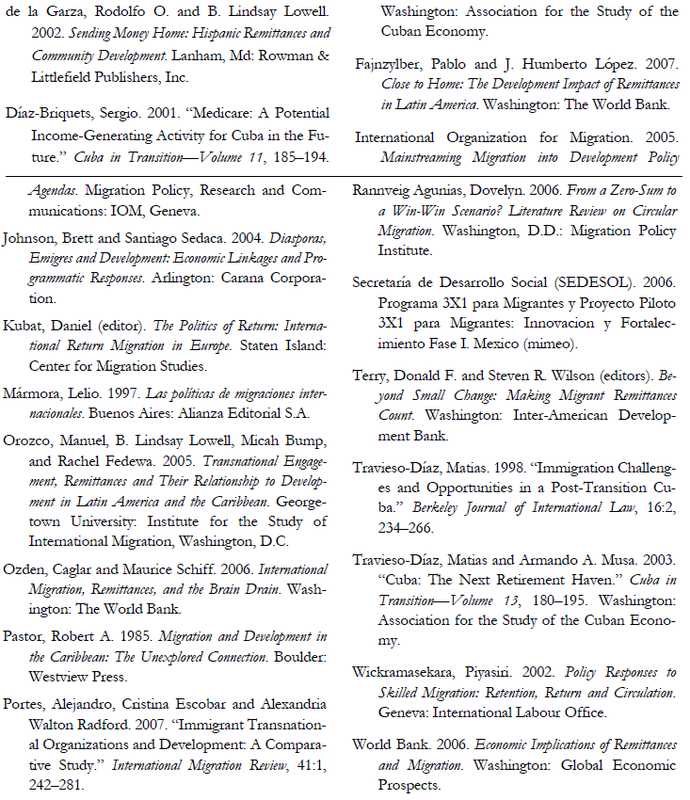 These are the philanthropic transnational immigrant organizations pooling migrant resources to promote socioeconomic improvements in local communities of origin (de la Garza and Lowell, 2002; Portes, Escobar and Walton Radford 2007; International Organization for Migration 2005). The manner in which these philanthropic organizations operate vary from country to country, but such is their promise that governments and international development agencies, such as the Inter-American Development Bank (IADB), are evaluating various schemes to maximize their potential. In Mexico, for example, an innovative program was launched in 2002—the “3 X 1” Program for Migrants to support migrant association initiatives to contribute to the development of communities of origin. Pooled migrant contributions are matched on a three to one ratio with funds provided through a loan extended by the IADB to the Mexican government (Secretaría de Desarrollo Social y Humano 2006). The program was established to coordinate joint development initiatives between migrant organizations and government, mostly at the municipal level. Projects funded include development of municipal infrastructure (e.g., community centers, water treatment plants, sports facilities, electrification) as well as the repair, maintenance, upgrading of existing facilities (e.g., paving of roads). One long term objective of the program—and similar projects implemented elsewhere in Mexico and other countries—is guiding migrant investments (and complementary resources) towards productive and sustainable projects capable of creating employment and generating wealth in local communities. The promise of a similar program for a post-transition Cuba is significant, particularly during the initial reconstruction and modernization phase, as émigré organizations could be provided with the managerial wherewithal to contribute to the development and/ or upgrading of the country’s basic economic (roads, electricity, telephones) and social (housing) infrastructure at the national and local level. Resources for such a program could originate from the Cuban- American community itself, perhaps complemented on a similar migrant-to-donor ratio by assistance programs funded by, for example, the U.S. Agency for International Development and reconstruction loans by international financial institutions (such as the World Bank and the IADB). The resources thus made available would not only contribute to upgrade the physical infrastructure, but also inject much needed investment resources to establish productive facilities by, for example, assisting with the emergence of a vibrant small business sector. Such programs could include small business development support centers modeled after those managed in the United States by the Small Business Administration (International Organization for Migration 2005:89). Émigré municipal associations (as well as U.S.-based religious organizations with ties to the Cuban-American community) are a natural bridge to their Cuban counterparts and could serve as the primary funnel to jointly engage in preliminary need assessment studies, raise the needed capital, and help manage local programs (International Organization for Migration 2005:78–79). Still another circulation modality for a post-transition Cuba is a reformulated program whereby Cuba could continue to offer internationalist medical services largely on a competitive and strictly voluntary basis, with professionals providing the services being compensated on a commercial basis. To an extent, this approach would turn the circulation concept around by rather than having the transnational tie anchored abroad, have it reside in the home country. The potential for this transnational approach for the provision of medical services is not inconsequential given the dearth of medical personnel in many countries, the overseas relationships established by Cuba with foreign governments over the last several decades, and by the Cuban-American community’s political clout in Washington. The last may make possible redirecting a portion of U.S. and other international development assistance resources to the provision of health care services by Cuban medical personnel engaged in short-term overseas missions. 1. The author acknowledges the useful suggestions made by Ricardo Puerta to an earlier version of this paper.